I was visiting Peterborough (Ontario) this weekend and went for lunch with my mom to the Planet. I used to go here all the time before I couldn’t eat gluten. I went back one other time since, and at the time, I think I could only get the chili, everything else seemed to be sandwiches. I was excited to see that they now have some gluten-free options. Unfortunately, the gluten-free bread is not vegan, but the wraps are. The wraps taste like those brown rice wraps you can get frozen at health food stores. I asked if I could get the vegan grilled vegetable sandwich on a wrap instead, and I could! It tasted pretty great. At the checkout to pay for our meals, my mom got a cookie, and asked the guy at the cash if they had any gluten-free baked goods. His reply? “Gluten-free stuff just doesn’t…uh..taste good.” My mom made sure to let him know that it wasn’t true, she got up in his grill and she pointed at me and said that I make awesome stuff. He said it was too hard for a restaurant to make good tasting gluten-free baked goods. It was kind of disappointing to hear someone who works in a bakery say that, considering I could name off a few bakeries in Ontario that have vegan and gluten-free stuff. Maybe I should start carrying mini cupcakes or donuts in my bag as a comeback for this sort of thing, ha ha. However, even though there were no dessert items, my meal was still delicious. Also, it is Peterborough, so having a vegetarian restaurant/bakery there is a miracle in itself. I recently started working at Ryerson. Ya! There are rare cases when I don’t bring my lunch, due to the usually terrible options available on campus. I decided to check out the new Urban Eatery in the Eaton Centre. All of the places use reusable plates and cutlery, which is cool. A lot of your typical fast food places could be found, with a few exceptions. I was incredibly happy to see that Urban Herbivore was there! For about 9 bucks, I got a gigantic bowl of quinoa, roasted peppers, tofu salad, heirloom carrots, beets, black bean salad, cucumber dill salad, pumpkin seeds and tahini dressing. They also had some gluten-free treats, which I haven’t seen them carry before. Definitely a nice change from the usual fast food options! I had to go back to Caprese and try something else from their menu. 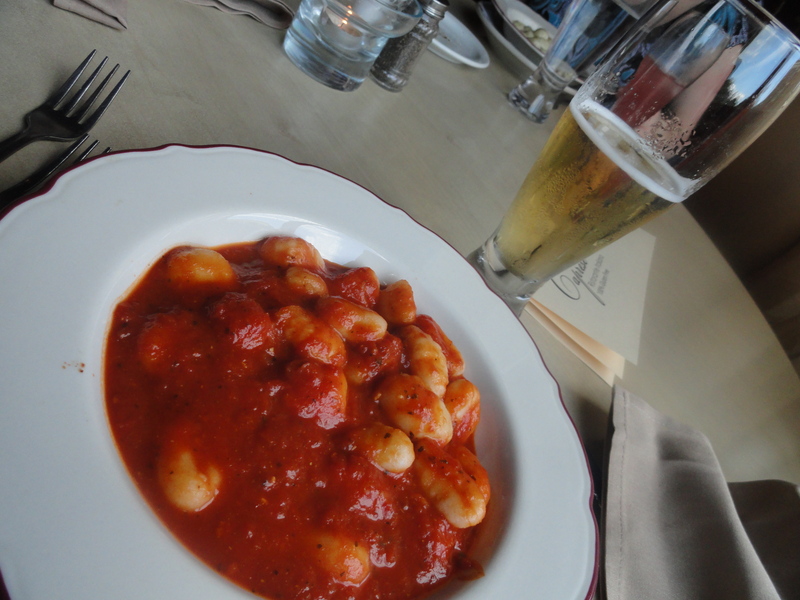 This time, I had gnocchi and it was probably the best I’ve ever had! We had the same waitress both times and she is really knowledgeable about the ingredients in the dishes and what is vegan or can be made vegan. It is such a relief to be able to go to a restaurant and know that you’ll easily be able to find something to eat. The only bummer is that the bread (which is supposed to be awesome) and desserts are not vegan. But still, the mains are great, and that is enough to keep me coming back. The other day, I decided to visit a cute little coffee shop right by my work called the Morning Owl for lunch. It was really busy and the staff were incredibly friendly. 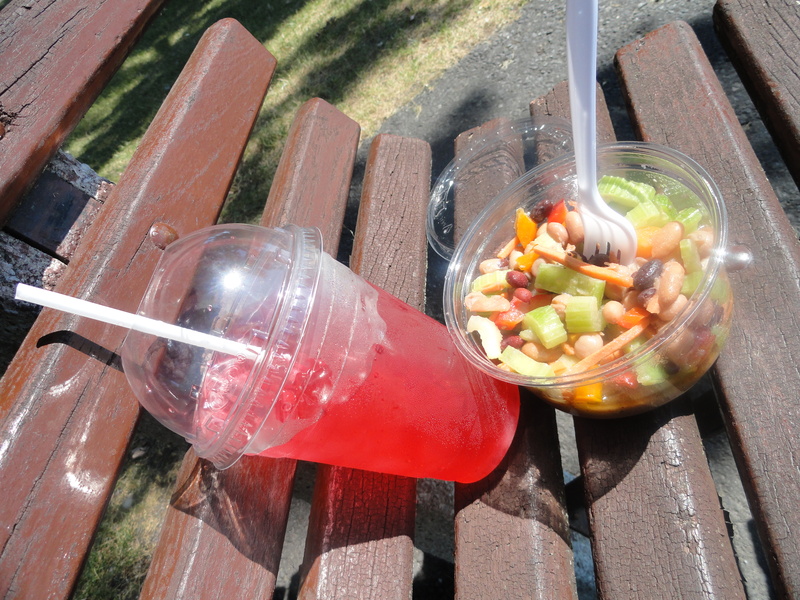 I heard that they had some gluten-free stuff, but it was so busy that I didn’t ask and just got a bean and vegetable salad and an iced tea. It was good and I think it might be the only place around that I can get something half-decent for lunch, so I will probably be back!